If you have interesting news and information about running, jogging and marathon which we should publish at this website then please send an email to us! Nearly 35,000 runners finished the Virgin London Marathon today as Kenyans Emmanuel Mutai and Mary Keitany capped a beautiful day in the capital with two superb performances in the elite races. Mutai smashed the course record with a dominating performance that left the many of the world's top distance runners floundering in his wake, while Keitany won the women's race in a time only world record holder Paula Radcliffe has ever beaten on the London course. Mutai became the first man in London Marathon history to complete the 26.2 miles in under two hours five minutes as he crossed the line in 2:04:40, the fifth quickest ever run, while Kenyan men swept the medals for the first time. Martin Lel completed a remarkable return to marathon racing after nearly three years out with injury as he outsprinted Patrick Makau in 2:05:45 to finish second while defending champion Tsegaye Kebede was fifth. Keitany moved to equal fourth on the women's all-time list with her winning time of 2:19:19 after surging away from defending champion Liliya Shobukhova. The Russian outkicked Edna Kiplagat to take second, the only non-Kenyan among the six medallists. It was a race of unprecedented quality as a record 22 women broke 2:30, a massive improvement on the previous best of 15. David Weir made history in the wheelchair races, becoming the first man ever to win five titles as he powered home in 1:30:05 just ahead of Swiss world record holder Heinz Frei, while American Amanda McGrory beat Shelly Woods on the line to regain the women's crown in a course record 1:46:31. Woods sliced more than a second off her British record in second place. Behind the stars, thousands of Guinness World Record chasers, fun runners and fancy dress fund raisers coped with temperatures rising to 20 degrees Celsius as they pushed themselves towards their personal goals. Sir Richard Branson, founder of the Virgin Group, set 35,303 on their way from Greenwich this morning after 35,643 had registered to run by close of play on Saturday from more than 45,000 accepted applicants. By 7pm this evening, 34,705 had crossed the finish line in The Mall. Among the masses of personal triumphs on a day that warmed and brightened by the hour were a record 33 Guinness World Records, including the fastest fairy (male) in 3:10:56, 10 minutes ahead of the fastest fairy (female); the fastest superhero in a truly super 2:42:46; and the fastest banana, in 3:45:42. As usual, many turned out in outlandish costumes and many thousands more ran to raise millions for hundreds of charities, not least Steve Chalke, the record-breaking fund-raiser who made it to the finish line in good shape, well on course for his £2 million target. The Marathon had its first Rubik's cube completer as Uli Killian solved 100 puzzles, while cyclist Chris Newton was the quickest celebrity in 2:58:52. James Cracknell was second in 3:03:56 with model Nell McAndrew third in another exceptional time of 3:08:25, 10 minutes ahead of actor Tony Audenshaw, 3:18:13. Footballer Dwight Yorke was half an hour outside his predicted time in 3:31:56, 10 minutes behind Muzzy Izzet, but Jamie Baulch eclipsed Iwan Thomas's personal best as he ran 3:51:40. Thomas was more than half an hour behind in 4:24:52. Matthew Pinsent just missed the four-hour target in 4:11:36, as did singer Will Young who clocked 4:02:35. Bucks Fizz duo Cheryl Baker and Jay Aston were just happy to see the line, Baker in 5:19:46 and Aston in 6:25:54. The youngest man to finish was Kieran Clark in 3:52:04, while the youngest woman was Helen Nutter in 4:24:10, both 18. The oldest man was Paul Freeman, aged 86, who finished in 6:47:31, while the oldest woman, Iva Barr, aged 83, crossed the line in 6:36:10. Despite the warm conditions, a relatively small number, 4,709 runners received medical attention during the day; 68 were taken to hospital. The ballot to enter the 2012 Virgin London Marathon opens online on Tuesday 26 April. The half marathon is still, of course, only half the marathon distance. Stay motivated, keep training, and set yourself a new goal: why not the Volkswagen Prague Marathon? More than £5.3 million from the record surplus made by the London Marathon last year was awarded in grants to help build, preserve, refurbish and purchase sports and recreation facilities, the organisers’ charitable trust announced today. The London Marathon Charitable Trust donated grants of between £1,852 and £235,000 to 59 projects in 25 local authority areas in and around the capital, as well as setting aside a further £1 million towards its commitment to support community legacy facilities after the London 2012 Olympics. The largest single award was a contribution towards the construction of new changing and community sports facilities in Victoria Park, Tower Hamlets, while the smallest, £1,852, paid for a twin-hulled canoe, known as a katakanu, at Hillingdon Outdoor Activities Centre. Other large grants included £215,000 to upgrade the athletics track and run-ups at the Lee Valley Athletics Centre in Enfield; £190,000 to redevelop Haggerston Baths in Hackney; and £150,000 to Samuel Montague Youth Centre to replace an old floodlit playing area with a new full-size multi-sports pitch. In addition, the Dudley Winterbottom Memorial Hall in Hackleton, Northamptonshire, near the site of the adidas Silverstone Half Marathon, received £80,000 to build a new two-storey annexe. £20,000 for improvements to Brittons Skate Plaza at Havering; £25,000 to upgrade Brockwell Park BMX track in Lambeth; and £25,000 to refurbish basketball and football pitches at Eleanor Smith Special School in Newham. Each year the surplus from the London Marathon Limited, which organises the London Marathon and other events, is transferred under Gift Aid to the Trust and the trustees award grants to further one of the objectives laid down by its founders, Chris Brasher and John Disley, namely: “to raise money for the provision of recreational facilities in London”. The amount awarded in 2010 brings the total grants made by the Trust to date to more than £40 million aiding more than 900 projects. The Trust’s chairman John Bryant said: “We are delighted once again to have been able to award so many grants to so many important local sports and recreation projects. Bryant, formerly the Trust’s vice chairman, took over as chairman this year when the previous chair, John Disley, was named president of the London Marathon. the 8th WMRA World Long Distance Mountain Running Challenge and 10th GM4O, will be held on 18th June 2011 in the small town of Podbrdo, Slovenia. Registration on the organizer’s website no later than 20 May 2011. Registration is considered confirmed upon receipt of the starting fee .There is a limit of 600 confirmed registrations on a first come first served basis based on receipt of the starting fee. London Marathon race founder John Disley CBE and Chris Chittell the well known actor from Emmerdale, dropped the famous chequered flag on the world renowned F1 circuit at Silverstone, the home of British motor racing, for the start of the adidas Silverstone half marathon. With just five weeks to go to the 2011 Virgin London Marathon, 6433 runners took to the famous racetrack to take part in the official warm-up race for next month’s Virgin London Marathon, to be held on Sunday April 17. Conditions were ideal for the 13 mile race, both for runners and the many spectators who witnessed bouts of glorious sunshine between some clouds, with temperatures at 5 degrees C, and an 8 mph north westerly wind, and 96% humidity. Twenty seven wheelchair competitors took part in the wheelchair event, who went off one minute ahead of the able-bodied field, with the leading finishers as listed below. Simon Lawson the champion in the men’s wheelchair race said ‘Great day, great weather, and although I caught quite a headwind at certain points, I was very pleased to beat last years time, and felt very good, so now I’m all set for the Virgin London Marathon in April’. Nikki Emerson, who took the women’s wheelchair crown, said ; ’I really enjoyed the race even though Silverstone is a really hard course, it was great to be racing against so many other wheelchair athletes and I’m now really looking forward to taking part in the Virgin London Marathon in April’. The mass field included many stars from stage and screen running and many of these part of the TV Times Leukaemia & Lymphona Research, Tony Audenshaw from Emmerdale, Richard Harrington from Larkrise to Candleford, Ben Jones from Doctors, John Michie from Taggart, to name but a few. Katie Price warmed up for her appearance at the Virgin London Marathon finishing in 2 hours, 59:54, and Ricky Wilson lead singer with the Kaiser Chiefs also getting a half under his belt in preparation for the streets of London in less than six weeks, finishing in 1 hour 35. Katie Price said; ‘I think that it’s all about the taking part, not about the place you finish in, and especially raising money for the charity of choice. (Katie was running today for Vision). It shows that it doesn’t matter what shape, size or age you are, its always a great personal achievement, everyone who took part today was amazing, and I will wear my finish medal with pride’. A team of runners linked together, who were in training for the 2011 Virgin London Marathon, where they will be going for a Guinness World Record for the most runners joined together to finish a marathon. The ‘Caterpillar’ finished today in two hours and 56 minutes 17 seconds, and is fundraising for the charity Scope. Start: Mountain lodge Boc (Near Rogaška Slatina), Wednesday 3.8.2010 at 6:00, Finish: Koper, Sunday 7.8.2011 , until 20.00 Total length: 360km stages: 5 stages , length from 47 up to 87km. Tromso - where your Arctic Adventure begins. Only 2000 kilometres from the North Pole, both visitors and local inhabitants will be entertained in this lively, warm and exotic city. Tromso hosts the northern most certified marathon in the world, the Midnight Sun Marathon. The race starts at 20:30 and most runners are finishing around midnight, but still the sun will be shining as it doesn’t set for 2 months - from 19th May to 19th July. Find more information on www.msm.no. The H.C. Andersen Marathon is named after the famous Danish author Hans Christian Andersen, whose books have been translated into more than 100 languages. The race takes place in the Danish city of Odense, where he grew up and wrote many of his most successful stories, including „The Ugly Duckling“, „The Emperor’s New Clothes“ and „The Little Mermaid“. More than 4,000 runners from 30 different nations will be competing in the H.C. Andersen Marathon on 18th September 2011, the fastest course in Scandinavia, holding a record of 2:10:43. The city of Odense will welcome you to the place where Andersen was born, and in memory of your race, you will receive a beautiful medal with a portrait of the famous poet. Welcome to the February/March issue of PACE, filled with all the latest information on upcoming events for you to enter and reviews of previous events to inspire you. John Stackmann's lyric poetry about run with fun. Costume contest at the TESCO Prague Grand Prix. Run in the costume of Pheidippides, the Greek soldier who ran the marathon distance for the first time ever, and take part in our costume contest which offers lots of great prizes to be won! The more disguised people around you, the more fun it will be! I am sending you some information about the Trans Slovenia 2010 mountain edition, ultra run Start: Logarska dolina (Logarska valley), Thursday 5.8.2010 at 7:00am Finish: Koper, Sunday 8.8.2010 , until 23.00 Total length: about 330km Marathon stages: 4 stages , length from 78 up to 90km. 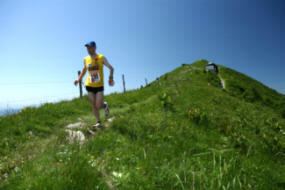 The detailed information about the ultra marathon coud be found on: http://mountain.trans-slo.si/en We are looking forward to meet you in Slovenia. With the race starting at 8:30 pm, you can run through the night, but in broad "daylight", with the beautiful arctic coast and nature of Tromso surrounding you, making this an unforgettable experience. 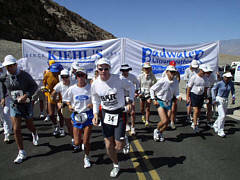 Marathon day also features several other shorter races, including a half marathon, mini-marathon and children`s race. START: Petrovo Brdo (altitude 803 m), 8 a.m. The race starts in front of a mountain hut on a mountain pass Petrovo Brdo (803 metres above sea level). The first 10 kilometres the track follow the Slovene mountain trail and after the first few kilometres the track reaches Kovce, a mountain plateau, which lies 1230 metres above sea level. In the continuation, the participants follow a nice alpine-runner friendly path, cross Vrh Bače pass (1270 metres above sea level) and run up to Kobla (1490 metres above sea level). After that ascent, the track sweeps gently to Kal, an alpine pasture at 1362 metres above sea level, where another sharp ascent begins and takes the runners to the highest point of the marathon, Čez Suho saddle (1760 metres above sea level), situated just below the summit of Črna prst. The highest point is also an intro to the longest descent (950 metres of height difference) down a marked mountain path over Kalarsko brdo saddle (985 metres above sea level) to Kal, a village at 817 metres above sea level. The participants then follow a nice hunter's path and later a kilometre of an asphalt road before they reach a small village Znojile. Prague has been chosen as the venue for the European Police Championship in Marathon for 2010. Representatives of the Police Sports Union in the CR, UNITOP, will organize this prestigious event in cooperation with Prague International Marathon. You can therefore expect to see more than 25 national police teams on the course of the Volkswagen Prague Marathon to be held on 9 May 2010. More information can be found on www.policejnimarathon.cz. … As he approached the last 200m in the lead of an 8km race, he pulled out a Sahrawi flag - illegal in Morocco and a symbol of the "Sahrawi Intifada" - and waived it across the finish line. Knowing he would be arrested on arrival in Morocco, he immediately sought political asylum in France and has been there ever since. Since that day, Salah has come to represent the Saharawi people not only in major sporting events around the world, but as a spokesman and ambassador for their cause. "With each victory I achieve in running," he says, "I denounce these violations on behalf of my people and I reaffirm my Saharawi identity." Reigning champions Sammy Wanjiru and Irina Mikitenko will return to defend their London Marathon titles next April against two of the strongest fields ever assembled in the 29-year history of the race. Wanjiru smashed the course record last April when he added the London crown to his Beijing Olympic gold, while Mikitenko will be chasing a rare triple after she retained her title in superb style in 2009. The German is aiming to become only the second woman ever to win three London marathons in a row following fellow-German Katrin Dorre’s trio of victories from 1992 to 1994. Yet both champions face stern tests if they are to repeat their triumphs on Sunday 25 April next year. Despite his brilliant win in a personal best of 2 hours 5 minutes 10 seconds this year, Wanjiru will be only the third quickest in the 2010 men’s field. Competition in the women’s race will be equally fierce. While Mikitenko heads the field with her German record of 2:19:19, the World Marathon Majors champion faces stiff opposition from Romania’s Olympic title holder Constantina Dita, all three medallists from the Berlin World Championships, and Britain’s Mara Yamauchi who produced a brilliant performance in 2009 to finish second just a minute behind the German in a personal best of 2:23:12. “My goal is to win a third London Marathon and equal Katrin’s record,” said the 37-year-old Mikitenko. “I love running in London and I am determined to be fit and ready for the challenge, although I know it will be difficult against such strong opponents.” In all, six athletes in the 19-strong field have broken 2:22 while 12 have run faster than 2:25. Athens Olympic medallist Deena Kastor is the second fastest in the field, and the American will be keen to repeat her 2006 London victory when she set a US record of 2:19:36. New York silver medallist Lyudmila Petrova has the third quickest time. She is one of five strong Russians, including fellow veteran Svetlana Zakharova, three-times a silver medallist in London, Liliya Shobukhova, the 2009 Chicago champion and third here last year, and Inga Abitova, winner of the recent Yokohama marathon. More than one record in 2009! Tesco Běh pro život On Saturday 12th September, 5650 runners experienced the magical atmosphere of Prague, running in a dazzling night under specially adapted artificial lights. The TESCO Prague Grand Prix officially closed the PIM Running Circuit 2009 with a record participation growth of 40%. Results are available on our website. Compare your results with other runners using a special Google Maps tool. You can watch the TV transmission online. Photographs are available on our website and on Facebook. The International Peace Marathon in Kosice has consistenly increased its number of participants. The 86th edition already has 4 268 registered athletes coming from 32 different countries. For 2009, it features a new race in form of a relay 4x 1 marathon. On the occasion of the 85th anniversary, the organisors are presenting the exhibition 'Tales of the eight decades" which will tour across Slovakia throughout September. 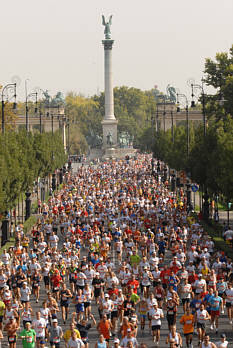 The largest half marathon of Central Europe was organised for the 24th time in Budapest last Sunday. There were overall 8500 participants; 5300 individual runners, 400 relay teams and around 2400 children and family members took part in the Fun Run (3,5km). Athens Marathon Run the original historical course of the Athens Marathon on 8 November 2009! When you run the Athens Marathon you travel in the very footsteps of the ancient gods and heroes that gave birth to western civilization. It’s a once in a lifetime experience and should be on every runners “to do” list. Along with the Athens Classic Marathon, a 10km and 5km Road Race will take place for anyone over 12. Run at night through the illuminated streets of Prague – unique way of discovering the historic centre. Run as individual or in a team of 3 (3 women, 3 men, 2 women/1 man, 1 woman/2 men). Experience the IAAF Silver Labeled Race differently! For every participant free adidas T-shirt and much more! In 2008, 10 411 participants of the first French Riviera marathon enjoyed the glorious Riviera weather and the spectacular view with the snowy mountains in the background. On 8 November 2009 even more runners are expected to line up on the “Promenade des Anglais” in Nice and to cross the finishing line in front of the Palais des Festivals in Cannes. Be part of it and enjoy the French touch! Dear sport friends, You and your company are dynamic, modern and fit? Then you will like the challenge. We are very pleased to invite you to take part in the Tesco Prague Grand Prix, the last event of the annual PIM Running Circuit, on Old Town Square, on Saturday September 12th, 2009. Don’t miss the chance to run at night through the illuminated streets of Prague – an unforgettable experience. Old Town Square and its surroundings will be animated with live music, dancing, fire shows and many other attractions. You have different options to be part of the event: adidas Women’s Race 5km at 7.30pm and Metro Men’s Race 10km at 8.30pm -	Run as individual -	Build a 3 runners‘ team (3 women, 3 men, or mixed teams 2 women/1 man, 1 woman/2 men) and run the correspondent races. The individual times will be cumulated for the final team ranking. For the mixed teams, men and women compete in their correspondent races. The winners will be awarded at the Final Party. ·	Run Tesco Run for Life 3.8km and support cancer research. Tesco Run for Life is a non-competitive charity race and will start at 6.30pm. The entire registration fee is donated to Children Oncology Fund Krtek. Tesco Run for Life is open to everyone in all age categories. As a traditional part of the event, we also organize the spectacular and prestigious Hilton Cloud 9 Barmen’s race. Be prepared for a great Saturday night out – it is going to be good for all of you, good for your team, and good for the cause you will be supporting. National Running Day on Wednesday, June 3, as we come together as a nation to take strides toward leading healthier, fitter lives. 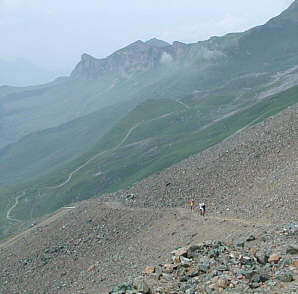 The 8th Marathon of Zermatt will take his run-up on July 4th, 2009 in St. Niklaus. For all the runners interested in an optimal preparation we propose a free training run on Tuesday, June 30th, 2009: it will be escorted by Stephan Tassani- Prell, the 1st Zermatt Marathon winner, and his wife Barbara. Two groups will go from Sunnegga to Riffelberg where a warm meal will be served. The clothes' transport will be provided from Zermatt to Riffelberg. Meeting point and time: Zermatt, at 9:30 a.m. at the Gornergrat Railway station. Information and registration by info@zermattmarathon.ch or at +41 (0) 27 946 00 33. The world is starting to pay more and more attention to the Budapest Marathon, which has become one of the favorite targets of the marathon-running society. Last year nearly 13 000 runners participated at the race in 10 different distances. There were 3000 runners who achieved the marathon distance. This is the only marathon race where you can run the 30k distance, which is very useful for those who are not prepared for the marathon yet. Teams or groups of friends can enjoy the relay race of 3 or the ekiden for 5 persons. The nice atmosphere and the total friendliness of the race are raised by street musicians along the course. The course is wide and flat so this is perfect to beat one’s personal record as well. A month earlier in September the Nike International Budapest Half Marathon takes place 24th time, which is similar to the marathon race in its nice atmosphere, relay, fun run and the same organization and the similar beautiful medal for each finisher. The start number allows you to enter the famous Széchenyi thermal bath for free after the race. Running through the world heritage of Andrássy Street and along the riverside that divides the city in two parts gives an unforgettable experience for every runner. Spectators are uniformly spread out along the course but slightly thin on the ground, so if you are more turned on by fantastic view and to running a quick time, this is your race. The next Budapest Marathon is on October 4, 2009. The next Budapest Half Marathon is on September 6, 2009. See www.budapestmarathon.com for more details. More than 35,000 competitors finished the London Marathon today, the last ever to be sponsored by Flora. By 7pm this evening 35,306 had finished after Sir Chris Hoy had set 35,747 on their way from Greenwich this morning, the second largest field in London Marathon history. 36,156 had registered to run by close of play on Saturday from nearly 50,000 accepted applications. At the end of 26.2 miles it was the Olympic champion Sammy Wanjiru who led them home, the Kenyan winning the fastest men’s elite race since the London Marathon started in 1981. Wanjiru crossed the line in a course record of 2:05:10 with Tsegaye Kebede of Ethiopia second in 2:05:20 and Jaouad Gharib of Morocco third in 2:05:27 – the second time in two years that three men have run quicker than 2 hours 6 minutes. Germany’s Irina Mikitenko defended her title to win the elite women’s race in 2:22:11 while Mara Yamauchi gave more than 750,000 spectators cause to cheer as the Briton finished second in 2:23:12, breaking her personal best by nearly two minutes. Russia’s Liliya Shobukhova was third on her marathon debut, clocking 2:24:24. Australian Kurt Fearnley beat Britain’s David Weir in a sprint finish to win the men’s wheelchair race in a course record of 1:28:56, while American Amanda McGrory took the women’s wheelchair title in 1:50:39 just ahead of last year’s champion Sandra Graf of Switzerland. Among the masses of personal triumphs on a beautiful Spring day, 10 Guinness World Records were broken including the fastest marathon dressed as Santa Claus (2:55:50 by Paul Simons), the fastest marathon dressed as a vegetable (3:34:55 by Robert Prothero) and the fastest fruit (4:19:37 by Thomas Day). There were also records for the fastest leprechaun (4:22:08 by Jack Lyons), the fastest animal (3:42:27 by Alastair Martin) and the fastest cartoon character (3:36:07 by Darren Stone). As usual, many turned out in fancy dress and many thousands more ran to raise money for hundreds of charities. One running couple were married en route – at St Bride’s Church in Fleet Street – while celebrities Katie Price and Peter Andre kept the photographers waiting as they jogged in seven hours and 11 minutes after the starting gun was fired at 9.45 this morning. 6038 runners received medical attention during the day (as did 120 members of public around the course), 35 were taken to hospital and 25 were admitted. he 2nd Lake Balaton Supermarathon ultra race of 4 days and 195,4 km has arrived to his end on last Sunday. Enthusiastic runners arrived from eight different countries to welcome the spring and the awakening nature at the most popular tourist target of Hungary, at the Lake Balaton. We are pleased to inform you about a new English language website that may be of interest to you and your German readers: www.runinternational.eu gives detailed information on a selection of running events in Slovenia, Croatia, Hungary, Italy (north-east) and Austria (south and east). This is the first time that information on running in this region is made available to a wider public. In our race calendar we have included only those running events that we think are of particular interest to runners from foreign countries. You will also find race reports, interviews, a glossary of useful words for running in this region, and an international partnership programme for running clubs/groups of runners. ou would be well-advised to spend a whole week in the Mattertal, not only to train for the Zermatt Marathon but also to attend the various tennis matches. More information in the next newsletter. To this day we have registered 494 entrants. Enrol as quickly as possible under https://secure.datasport.com/?Zermattm09 .We draw again your attention on the services included in the registration It's worth it. Holy cows and street dogs, this is morning life in India. If you run early in the morning, before or around sunrise, the air is better than in the evening. Its cooler too. But I didnt want to run longer than 45 min, because it gets noisy, crowded, polluted and warm. A unique ultra race around the Lake Balaton (Plattensee) in Hungary. The distance is 196 km and this is a four day long race with ca. 50 km per day. Early spring is beautiful at the lake! The race can be run individually, in pairs or in a team of four. Suitable for beginner ultra runners, for experienced ones as the first race in the season and also for groups of friends, colleagues. Paula Radcliffe will bid to win her fourth Flora London Marathon on 26th April against one of the strongest fields she’s ever faced. After winning in 2002, 2003 and 2005 Radcliffe aims to emulate her mentor Ingrid Kristiansen, the Norwegian who won the London Marathon four times between 1984 and 1988. “It’s fantastic to be back at the Flora London Marathon,” said Radcliffe. “I’ve missed the last three years through injuries and it was frustrating not to be fully fit for the Olympic Games this summer. Radcliffe has set world records in all three of her previous appearances on the London course. But such is the depth and quality of the 2009 field, she is likely to be racing the opposition as much as the clock next April. 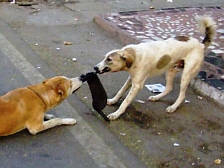 After her impressive victory in 2008, Mikitenko will not want to give up her title easily. The German went on to win the Berlin Marathon in September and last month was crowned the 2007/08 World Marathon Majors champion. Olympic gold medallist Constantina Dita returns to London for the eighth time seeking her first win in the British capital. The 38-year-old Romanian surprised many with her bold victory in Beijing but she’ll face a test every bit as tough in London. Alongside her on the start line will be the world champion and Olympic silver medallist, Catherine Ndereba of Kenya; China’s Zhou Chunxiu, the Olympic bronze medallist and 2007 Flora London champion; and Ethiopia’s Gete Wami, second in London two years ago and the inaugural World Marathon Majors champion. Wami is joined by her compatriot Berhane Adere, a double winner of the Chicago Marathon, while the Russian veterans Lyudmila Petrova and Svetlana Zakharova also return to London seeking their first wins. Both have finished second in the past – Petrova in 2006 and Zakharova in 2008. Petrova also finished 2nd behind Radcliffe in the New York Marathon this November. Radcliffe will be supported by two fellow-Britons – the ever-improving Mara Yamauchi, who was sixth in the Olympic Games, and Jo Pavey, the Commonwealth 5000m silver medallist, who makes a much-anticipated marathon debut. Flora London Marathon race director David Bedford said: “We are delighted to welcome Paula back to the Flora London Marathon after an absence of four years. Her superb victory in New York showed that she is back to full fitness. “Naturally, she is keen to regain her London title but this will be her toughest marathon yet. With nine women who have run quicker than 2:22, this is without doubt the best field we’ve ever assembled for the women’s race. Lel looks for London record Reigning champion Martin Lel returns to defend his Flora London Marathon title on 26th April next year against one of the strongest fields ever assembled for a big city race. After victories in 2005, 2007 and 2008, Lel is aiming to become the first man to win four London Marathons and only the second man to win three in a row, following the Mexican Dionicio Ceron who had three straight victories between 1994 and 1996. Last year Lel set a superb course record of 2hrs 5mins 15secs, making him the fourth quickest marathon runner ever. But with all three Olympic medallists from Beijing, a former world record holder, the first four from London last year, two other previous London champions, and a much-fancied debutant in the field, this could be the Kenyan’s toughest test yet. Chief among his challengers will be Sammy Wanjiru whose victory at the Beijing Olympic Games was described by some as the greatest marathon performance of all time. The 22-year-old Kenyan will have high hopes of improving on his second place last year when he finished just nine seconds behind his older compatriot. Wanjiru will again meet stiff opposition from former 2 time World Champion and Olympic Silver medallist Jaouad Gharib of Morocco and Bronze medallist and BUPA Great North Run winner, Tsegaye Kebede from Ethiopia. Khalid Khannouchi of USA, a former world record holder, and Felix Limo of Kenya, a former world champion, will want to regain the London titles they won in 2002 and 2006 respectively. Both are hugely experienced marathon men. Yet, many will have their eyes on a debutant – Zersenay Tadese. The Eritrean is a double World half marathon champion, former world cross country champion, and the 2004 Olympic 10,000m bronze medallist. Tadese joins his compatriot Yonas Kifle, a sub-2:08 man at his best, while Viktor Röthlin of Switzerland will lead the European challenge after finishing sixth at the Olympic Games. Flora London Marathon race director David Bedford said: “With 11 men who have run faster than 2:08 this is probably the highest quality field we’ve ever assembled for the men’s race. “In particular, we are delighted to welcome back our reigning champion Martin Lel and the Olympic champion Sammy Wanjiru whose performance so delighted us this summer. On July 5th, 2008, by a magnificent weather, 1229 runners appeared at the start of the 7th Zermatt Marathon in a majestic setting of mountains. A big thank to everyone of you, your enthusiasm and your sportsmanship propelled this extraordinary mountain running on the place which it occupies today. This smooth progress brought us many satisfactions. Number of runners tell us how much they were pleased and comforted by the familiar atmosphere. All the team of assistance felt a big enjoyment to be at your sides to support you. The organization committee thanks very cordially the 453 assistants, men and women, and all the sponsors and partners. Some of you came far away to participate to this 7th Marathon of Zermatt. Three Australian runners gain the palm of the distance. Thank you also to the sporting passionate persons of 26 nations who had moved to participate to this exceptional mountain running. Your reactions incite us to prepare with trust and cheerfulness the 8th Marathon of Zermatt with the desired improvements until the 4th of July, 2009. Dear fans of running, the „last-but-one“ infomail about events of Prague International Marathon in 2008 is here! With the end of season, the majority of you judges the personnal records and other improvements you have achieved. Also for our team the on-coming end of year brings a new motivation to further innovations and creating even better conditions for you in 2009. You are most welcome to accept our appeal and send any suggestions to our „feed-back“ e-mail address marathon@pim.cz . 35 € for Hervis Prague Half Marathon (March 28, 2009). As the number of participants is limited, remember to register in time. This is a quick link to on-line registration form for Volkswagen Prague Marathon and Hervis Prague Half Marathon. After fourteen wonderful years, 300,000 runners and a staggering £422 million raised for charity, the 2009 London Marathon marks the final year of Flora as sponsor. This year’s marathon is Flora’s chance to say thank you to everyone who has been involved in the marathon and to join us in celebrating our time together. Therefore, we want you to be among the first to get involved. As part of this celebration, Flora has developed a special website. This website is dedicated to marking the achievements and memories of every single person who has been involved in the Flora London Marathon, not just over the past 14 years but since the marathon began in 1981. We would love to hear about your memories and experiences of the marathon, whether as a runner, supporter, volunteer, staff member or any of the other millions of people who make the event what it is. We are aiming to create the worlds biggest thank you card, one on which everyone can say their very own thank you to Flora. We want you to tell us (in no more than 50 words) what the Flora London Marathon means to you and why you are thankful for having had the chance to be involved in it. There will be a photo album to place all those magic moments caught on camera. We would like you to submit you favourite photo, give it a title and a caption to tell us a bit about it. We want to hear your marathon stories. It can be anything significant to you about your experience with the marathon. Maybe you’ve been sponsored a friend or loved one to take part? Did you meet someone during the race that you’ve never seen again, who got you through those tough miles when you hit the wall and helped to get you to the finish? We want to know! We hope to create a vast online memory bank of stories and images so please get in touch. Please send your favourite marathon images and stories to us at sam@ktbpr.com by the 18th October so we can get them uploaded and ready to go for the launch of the website ( www.memory-joggers.co.uk ) in early November. If any of your friends and family have been involved in the Flora London Marathon, please also encourage them to get in touch. The largest half marathon of Central Europe was now organised for the 23rd time in Budapest. Overall almost 7000 runners took part on the event. Besides the 21 095 meter long half marathon distance, the runners could also choose to run the race in a team of 2 runners and there was also a fun run of 3,5 km organised for children and family members. This year the organisers designated a new course leading along the river Danube and in the city center showing the most important sights of Budapest with places that are part of the World Heritage. The organisers put emphasis on this race on amateur runners, thus no professional runners were invited. The race was won with a moderate winning time of 1:07:22. Among the runners there were more than 1000 runners from abroad. The majority came from the United Kingdom. The second most populous nation was Germany with more than 100 runners, followed by Italy, France, Denmark and the USA. There were runners even from such far away countries like New Zealand, Israel and Mexico. The next Budapest International Half Marathon will be organised on 6 September 2009! For more details about the event and information on how to enter, visit: http://www.sam-maraton.com. Paula Radcliffe has been forced to pull out of this year’s Flora London Marathon with a toe tendon injury, just five months before her bid to win gold at the Olympic Games in Beijing. The world marathon record holder, who was aiming to win her fourth Flora London Marathon title on Sunday 13th April, sustained the injury to her right toe while altitude training at her base in Albuquerque, New Mexico. “I am desperately disappointed that I have to pull out of this year’s race,” said Radcliffe, who was Flora London Marathon champion in 2002, 2003 and 2005. “I love running in London and this race would have been the perfect test for me before the Olympic Games. While the 2005 world champion admits the injury is a blow to her plans she describes it as “minor”, and still believes she can be in excellent condition for the Olympic marathon on 17 August. Commenting on Radcliffe’s withdrawal from this year’s race, Flora London Marathon race director David Bedford said: “Of course, it is a major blow to lose Paula from this year’s race but we understand that her priority in 2008 is to be in peak condition for the Olympic Games and we wish her all the best for a speedy return to full fitness. The women’s line-up includes the World Marathon Majors champion Gete Wami of Ethiopia, the reigning Chicago champion and Ethiopian record holder Berhane Adere, Romania’s record holder Constantina Tomescu-Dita, and the veteran Russian Svetlana Zakharova. In Wami, Tomescu-Dita and the Kenyan Selina Kosgei, this year’s race includes the runners who finished second, third and fourth respectively in the 2007 London Marathon. No fewer than four of the elite line-up have run quicker than 2 hours 22 minutes and seven have run a marathon faster than 2:25. There is still considerable British interest too in the battle between Hayley Haining and Liz Yelling for a place in the Great Britain Olympic marathon team. The two are separated by just one second on their best marathon times. Two of the world’s brightest new marathon stars have been added to the men’s elite line-up for the 2008 Flora London Marathon, boosting a field already regarded as one of the best ever assembled. World half marathon record holder Sammy Wanjiru of Kenya and US champion Ryan Hall join the World and Olympic marathon champions, Luke Kibet and Stefano Baldini, the former World record holder, Paul Tergat, and the defending London champion, Martin Lel, in the race to become the 2008 Flora London Marathon champion on 13 April. Hall and Wanjiru both made sparkling marathon debuts in 2007 and have chosen London for their first major race of 2008 as they build up to the Olympic Games in Beijing in August. “I am delighted that these two highly talented young marathon runners will be part of the London Marathon story in 2008”, said Flora London Marathon race director Dave Bedford. “We have assembled one of the best ever fields for the race this year and the competition will be as fierce as ever, but I am sure Sammy and Ryan will be among the main contenders as the athletes approach the finish line in The Mall”. Wanjiru made the step up to marathon running in 2007 after a highly successful career at half marathon. He broke Tergat’s long-standing World half marathon record in 2005, then reclaimed it from Haile Gebrselassie in February 2007, before lowering it again to 58 minutes 33 seconds in March. After finishing a close second to Lel in the Great North Run, the 21-year-old went on to win the Fukuoka Marathon on 2 December at his first attempt at the distance, breaking the course record with a time of 2 hours 6 minutes 39 seconds, the third quickest in the world in 2007. Wanjiru has said he hopes to run 2:05 in London as he believes that’s what it will take to be selected for the Kenyan Olympic team. Hall is already assured of his place in Beijing having won the US Olympic Men’s Marathon Trials in New York on 3 November beating the likes of Meb Keflezighi, the 2004 Olympic silver medallist, and former world record holder Khalid Khannouchi. The 25-year-old made his marathon debut in London last year when he finished seventh in 2:08:24. He burst onto the world distance running stage a year ago in Houston when he smashed the North American half marathon record that had stood for 21 years, crossing the line in 59:43.
the real,- Berlin Marathon (September 28), the Bank of America Chicago Marathon (October 12), and the ING New York City Marathon (November 2), plus the Olympic Games marathon races in Beijing (August 17 for women and August 24 for men). The 16th Jungfrau Marathon will take place on 6 September 2008 with 4000 starting places once more available. If the number of registrations exceeds 4000 by 28 February 2008, we shall make a random draw. Until this date, all registrations received count as provisional! If you have taken part in the Jungfrau Marathon in Interlaken in the last three years, you will automatically be sent a personal ticket for the draw (with integrated reference number), in December. Please sign and return this ticket to us as soon as possible. If you would like to start in Interlaken for the first time in 2008, we will be happy to send you the latest information or you can register here using the online form. If luck is with you in the draw, you’ll receive confirmation of your starting place with payment terms during the month of March. The names of the runners who have been drawn will be published on our Internet site under "Provisional Starting List". The London Marathon Ltd and Nova International Ltd are delighted to announce a new exciting Road Race, the BUPA London 10,000 which will be held on the course which is expected to be used for the 2012 Olympic Marathons. The 10,000m race will start and finish in St. James’s Park and use Green Park as its assembly area. The race will start on Birdcage Walk and follow an anti-clockwise route around the City of Westminster and the City of London via Parliament Square, Embankment, Blackfriars Bridge, Queen Victoria Street, Cannon Street. Great Tower Street, Crutched Friars, Fenchurch Street, Leadenhall Market, Cornhill, Queen Victoria Street, Puddle Dock, Embankment, Horseguards Avenue, Whitehall and via Trafalgar Square to the Finish in The Mall. The race passes many of London’s famous sights. The BUPA London 10,000 is presented by the London Marathon Ltd and Nova International Ltd, the organisers of the BUPA Great North Run, and represents the first time these two organisations have worked closely together on such an exciting new event . London Marathon will be responsible for event logistics and Nova are working on a number of areas including sponsorship and TV coverage. BBC television will be presenting a highlights programme of the event. 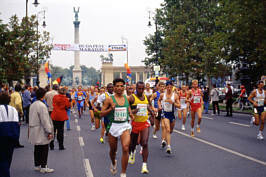 30 September 2007 was the date of the 22nd Plus Budapest International Marathon. On this day Budapest turned into a sanctuary of running. Overall on all the different distances (7 individual distances and 2 relays) organised there were 13 600 runners on the streets of Budapest. On the classical distance of 42,195 K there were more than 3000 individual runners and almost half of them were foreigners. Also a uniquely new distance of 30 K was also organised this year where almost 500 runners joined the marathoners at the 12,195th kilometre of the race to finish it together. The organisers of the race did not invite foreign elite runners, the Budapest Marathon this year; the two winners of 2006 won the race also in 2007. The 42 kilometres passed by the most beautiful parts of Budapest, among them the Andrassy Street and the Buda Castle which are parts of the World Heritage. There were 35 music stations along the course to cheer the runners and help them achieve their desired time objective. The eldest Hungarian runner was 80 years old and ran a new Hungarian record in his category, finishing in 4:40. Overall this year 1600 foreign runners came to Budapest from 40 different countries; the most runners came from France and Finland, followed by runners from the UK, German, Italy and the USA. There were 114 German runners on the 42 k distance, among them 104 male and 10 females. The result of the fastest German man was 3:01:31 and the result of the fastest German woman was 3:43:55. Congratulations! 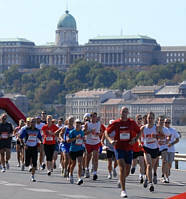 The 23rd Plus Budapest International Marathon will be held on 5th October 2008. “Naturally we are very pleased to have the World and Olympic 5000m Champion Meseret Defar, fresh from her victory in Osaka heading up our elite field in London, the UK’s premier 5k women’s road running event” said Race Director David Bedford. The British challenge will be headed up by Jo Pavey, following her seasons best at the 5000m World Athletic Championships in Osaka (15:04:77). Jo also took fourth place the 10,000m (32:03:81), and will be joined by Liz Yelling with a pb for 5000m (15:38:86). Jessica Ennis, fourth in the World Championship heptathlon in Osaka will also be running in Hyde Park. Linda Robson, best known as Tracey, from Birds of a Feather, and now guest presenter on BBC London, will set off the field at 11am on Sunday. With a total field of 15,000 women expected to line up in London, all taking part in the tenth running of the event, and with a figure of more than two and half million pounds expected to be raised for over 1600 different charities, from the three events in London, Birmingham and Liverpool, this will make for a truly prestigious event. Amongst these runners will be the familiar celebrity faces of Jo Brand, Floella Benjamin, Ruth Langsford, Kellie Shirley and Beverly Knight. BBC London will be broadcasting live on radio from Hyde Park with presenters Kath Melandri, Michelle Gayle and Jo Good. Simultaneously, races will be starting at 11am in Sefton Park in Liverpool, and at the slightly earlier time of 10.30am in Birmingham City Centre. The elite field in Birmingham includes Polish Champion Karolina Jarzynska (POL) with a 5K best (16:06). Although entries for the three events are now closed, please visit www.london-marathon.co.uk for further information. Dear sport friends, Night Grand Prix 2007 on September 8, 2007 will feature the adidas Women's Race 5km and the Metro Men's Race 10km starting at 8 and 9 pm. on Old Town Square right in the center of Prague. Both Women and Men Team Races will start at the same time. Night Grand Prix 2007 is promising a very beautiful experience of running on the illuminated course through the streets of MAGIC, historic Prague. Night Grand Prix 2007 is also featuring the 2nd edition of Embassy Race. Foreign embassies and Czech Foreign Ministry teams will run in the Team race within the adidas Women's Race 5km or the Metro Men's Race 10km. This year, let's see which teams will beat the strong team of the US marines that mastered last year's race. Traditional Hilton Barmen Race will be back in action, as well. Teams from different bars from all over Prague will compete in non-traditional "athletic" disciplines. Old Town Square will definitely be pulsing with sport energy and rhythms to keep you moving, on Saturday Night, September 8, 2007. Traditionally Prague International Marathon has connected sports with culture and this year will be no different. Marathon Music Festival will be hopping, as usual, getting the crowds and race participants moving and grooving, completing the "Saturday Night Fever" in Prague! We have something fabulously fun to look forward to! Last but not least, PIM has prepared for the runners from abroad flexible travel packages for this year's Night Grand Prix. These packages include: accommodation in single or double rooms in *** hotels nearby start-line for two nights (7-9 Sep) with breakfast plus Night Grand Prix entry fee for 110? (single room) or 160? (double room). Special and additional services can be arranged for the runners upon request. Whether you are looking for free low fat recipes to eat a healthy - but tasty - meal, or whether you are on a weight loss program and want to eat something exciting, delicious and easy to prepare, then http://www.delicious-low-fat-recipes.com is the right place that you should visit! The spectacular Swiss Alps host the world champions of ultra running! Verbier Ultra Run offers beautiful scenic quality in a trail race. The 60km race is a buckle (loop) and another partial loop. The 20km is one loop. The altitude is to 2747 meters. The course travels through trails, pathways, and roadways. There is prize money and assistance with travel and hebergement. The London Marathon Charitable Trust has saved another London playing field using funds allocated from the record surplus made by the London Marathon Limited in 2006. The Birkbeck College playing fields in Greenford, west London, are the fifth set of playing fields in the capital to be saved from the clutches of private developers by the London Marathon in five years. The fields were being underused by the local community and threatened by vandalism before the London Marathon provided £850,000 to the London Playing Fields Foundation to buy the land from the City Parochial Foundation, to install drainage and update equipment. The fields – to be renamed the London Marathon Playing Fields - will now be owned and managed by the Foundation. The London Marathon believes recreational space is a vital part of every community, but there is no statutory protection for playing fields in the UK, and on average one playing field every day comes under threat from building development. John Disley, chairman of the London Marathon Charitable Trust said: “This opportune purchase of another threatened London playing field shows how vital it is for funds to be instantly available to forestall the ever land-hungry ‘developer’. Dr Charles Goodson-Wickes, chief executive of the London Playing Fields Foundation, said: “Our partnership with the London Marathon Charitable Trust has proved itself the most effective agent for saving playing fields in Greater London. Their support for our charitable objects is absolutely invaluable. The grant to save the Greenford playing fields is just one of 37 awarded to sports projects and recreation facilities around the capital by the Trust in 2006/07. The grants amount to more than £3 million, bringing the total donated by the Trust since its inception in 1981 to £21,953,784. The Trust has aided more than 600 projects in London, plus others in Birmingham, Milton Keynes and Liverpool. This year projects across the London boroughs have been allocated grants of between £3,500 and £150,000. The largest grant, of £150,000, was donated to develop an indoor athletics centre next to the Terence McMillan Athletics Stadium in Newham. The trustees also made grants of £100,000 to the Corporation of London for new changing rooms at Wanstead Flats; £100,000 to the London Community Cricket Association to install indoor training facilities at Plough Lane Cricket Centre in Sutton; £92,053 to the Metropolitan Housing Trust for a new sports hall at Corry Drive; and £135,000 to the Royal Parks to refurbish the sports pavilion and six tennis courts in Greenwich Park. The world’s greatest marathon runners will go head-to-head in a battle for the 2007 men’s Flora London Marathon title on Sunday April 22nd. Last year’s fastest marathon runner Haile Gebrselassie will take on his great rival and world record holder Paul Tergat of Kenya, plus Italy’s Olympic champion Stefano Baldini, Morocco’s double world champion Jaouad Gharib, and the reigning London champion Felix Limo of Kenya, in one of the highest quality men’s fields ever assembled for a major city marathon. Gebrselassie returns to London 12 months after finishing a disappointing ninth in the 2006 race but on the back of some highly impressive form in the latter part of last year. The Ethiopian – a double Olympic and four-time world 10,000m champion – recorded a personal best of 2:05:56 to win the real,- Berlin Marathon in September, making him the fifth fastest of all time, and also won the Fukuoka Marathon in December. Tergat set his world record of 2:04:55 in Berlin in 2003 but was forced to pull out of the London Marathon last year after sustaining an injury just a few days before the race. The 37-year-old, who finished second in London in 2001 and 2002, will meet Gebrselassie over the marathon distance for the first time after a track rivalry that stretches back to the 1993 World Championships in Stuttgart. But these two will certainly not be the only contenders. Limo proved last year that he is a hard man to beat as he added the London title to previous victories in Rotterdam, Berlin and Chicago, and this year he will aim to become the first man since Mexico’s Dionicio Ceron in 1996 successfully to defend the men’s London Marathon crown. Fifth last year, Baldini will be full of confidence for his eighth appearance in London after adding the European Championship title to his 2004 Olympic crown last summer, while Gharib will be hoping to improve on finishing second in 2005 before he defends his World Championship title in Osaka in August. Other significant contenders include: the surprise winner of the 2006 ING New York Marathon, Marilson Gomes dos Santos of Brazil; the impressive American pair of Olympic silver medallist Meb Keflezighi and former world record holder Khalid Khannouchi; and Kenya's Martin Lel, the 2005 London champion, who lost to Limo last year by just two seconds. The addition of South Africa’s Hendrick Ramaala, who was third last year, means that the top five finishers from 2006 return to contest the 2007 race. The British challenge will be led by Jon Brown, who has twice finished fourth at the Olympic Games. Brown was forced to miss last year’s race due to injury but returns to the London field hoping to improve on his sixth place finish in 2005. As well as chasing prize money and record bonuses totalling more than $250,000, the competitors in this year’s race will also be fighting for points towards the World Marathon Majors (WMM) series. The other WMM races this year are the Boston Marathon (April 16), the real,- Berlin Marathon (September 30), the LaSalle Bank Chicago Marathon (October 7), and the ING New York City Marathon (November 4), plus the IAAF World Championship marathon races in Osaka (August 25 for men and September 2 for women). The Flora London Marathon announced today that the 2004 Olympic Marathon Champion, Mizuki Noguchi will be taking to the streets of London next year on Sunday April 22nd, heading up the strongest women’s elite field ever seen over this distance. Mizuki Noguchi commented; “The Flora London Marathon brings together the highest level athletes. I have decided to go to London because I want the opportunity to test myself against the best athletes in the world”. Noguchi’s winning time in Berlin in September 2005 (2:19:12) set three new records; the Berlin course record, the Japanese record and the Asian record making her the third fastest female marathon runner of all time. Race Director, David Bedford commented “We are extremely pleased to have such a strong field in London including the Olympic Champion. I feel this is the most competitive women’s field that has ever been assembled in London, and we are looking forward to witnessing a very exciting race. The women’s race will be run under Championship conditions with no male pacemakers”. Other major signings include Asian Games Champion, Chunxiu Zhou (CHN), and first and second respectively placed women in Chicago in October, Berhane Adere (ETH) and Galina Bogomolova (RUS). They are joined by Lyudmila Petrova (RUS), second in London this year, Benita Johnson (AUS), third in Chicago, Salina Kosgei (KEN) and Inga Abitova (RUS), European 10,000m champion. Making her marathon debut is Isabella Ochichi (KEN), Olympic 5000m silver medallist. Over 96,000 UK applications were received for the 2007 ballot of the Flora London Marathon, taking place on Sunday 22nd April next year. The Flora London Marathon is the largest annual fundraising event in the World, with over £41 ½ million raised by runners for charity in the 2006 Flora London Marathon, bringing the total amount raised for charity by runners since the race began back in 1981, to a grand total of £315 million. AIX-LES-BAINS (France) 5/06, 2006 – As the cream of North America’s adventure racing elite prepares to enter the fray for the first time this season, the 2006 X-adventure The Raid World Cup heads to the state of Idaho. This tenacious tussle between visitors and locals will go a long way in deciding which teams will occupy the 6 qualifying spots in the North American Zone. The region around McCall and Cascade is replete with a wealth of outdoor attractions that include majestic peaks, towering forests, crystal-clear lakes and rapid-strewn rivers. This mighty wilderness will provide the natural arena in which the 14 “away” teams from around the world will compete with 25 top-notch contenders from the USA and Canada for the much coveted points on this 2nd and pen-ultimate qualifying stage of the Adventure Racing World Cup. Competing for the first time this year is a group of powerhouse squads from Europe: 2005 The Raid victors LES ARCS QUECHUA (FRA), along with WILSA SPORT-HELLY HANSEN (FRA), ADIDAS NATVENTURE (GER) and COSTA DAURADA LA PINEDA PLATJA (ESP), will need a convincing performance to avoid a possible points scramble during the final qualifying stage next month in France. Lining up against this formidable opposition is a horde of teams almost all of whom are compelled, thanks to a pervasive “one bite at the cherry” philosophy, to outperform Zone favourites like A/R giants NIKE (USA), NIKE/BEAVER CREEK (USA) and SUPPLIERPIPELINE (CAN). The overwhelming requirement for local teams to obtain a maximum of points on this stage will certainly spur the race pace. Surprisingly absent from the mix are SPYDER (USA), holding enough points from their 1st stage win to sit back and enjoy the struggle on home turf. But Mother Nature too is also capable of a few surprises on a course that will include some of the finest white water action ever seen on the circuit, with rivers swollen by snowmelt. However, not all the snow is flowing into the rivers and, at altitude, snowshoes will be necessary for the athletes to progress. Top this off with a magnificent 200 metre rappel and you have all the ingredients for another “to the wire” struggle. The Kalahari Augrabies Extreme Marathon was very successful even though we had a small field, with all the international runners who had previously run MdS, comparing it very favourably with it. The dates for next year are 05 - 15October 2006. Also, on 18March2006 we are hosting the 2nd Addo Elephant 100Miler and 50Miler Trail Run. The route is set on the 4x4 tracks through the Addo Elephant National Park, its closest town being Port Elizabeth. We started today our english forum for runners. Dear runner, I am sending you the information about the Verbier Ultra run in Switzerland. Start Time for 50km and 80km - 7:30 a.m. Start Time for 20km: 9:00 a.m.
Grete Waitz offers tips on treadmill training. Kenyan Paul Kirui and Moroccos Hafida Izem were the winners of the 30th Rome-Ostia Half Marathon, held in hard weather conditions from the city of Rome to the Ostia Lido. Kirui closed out the race in 60:22, the best time of the year, just 16 seconds off the course record set by Robert Cheruiyot in 2002 (60:06). The 7000 runners found the snow to welcome them, an event you hardly ever expect to see in Rome. Snow had paralyzed the whole of Northern Italy on Saturday and so the double World Championships Marathon bronze medallist Stefano Baldini, was only able to arrive in Rome just after midnight by train, because Bologna Airport was closed. Many other participants had similar problems to reach the capital.